From the charity shop finds, to the beautiful bits I acquire whilst sourcing product for Melody Maison and WindsorBrowne , my house is fairly full to the brim, so what do I do with them? Mix it up! – By all means pick a style, or a colour palette, but don’t shop for everything in one place. Visit car boot sales, eBay, charity shops (some of my most amazing finds are from these sort of places, and you get a double glow from owning something wonderful, but that only cost a few pounds , sometimes pence!) Then visit the vintage fairs, antiques markets and your favourite On-line and high street retailers as well as unusual boutique home wares shops so your collections are diverse and an interesting talking point ( I love telling stories of my nik-nak finds to anyone who will listen, from the beautiful mirror I found in a skip, to the jug I paid a £1 for that was worth £50! Always buy with your heart, choose things that speak to you – usually with the words “if you don’t buy me today I wont be here tomorrow, and then you will be sad!” Never buy just because you think the shape or colour is the missing thing, rather than just loving it yourself. I have bought plenty like this, and now I’ve learned to stop and think, ‘can I look at this every day for years and still love it?’ if the answer is Yes, great, you know what to do! Don’t be frightened of mixing colours and styles. If you are choosing with your heart then it will usually work. And if it doesn’t , start a new collection elsewhere! Interior design rules typically says choose no more than 3 colours, and stage things in groups of descending sizes….blah, blah, blah. When choosing colour, I say pick 3, pick 7, pick 9, as long as they all speak to each other, or reference something else in the room, like a flower in a rug, or a design on a cushion, go for it . This is not show home arranging this is maximalism! So you’ve got past the colour thing, now what about themes. 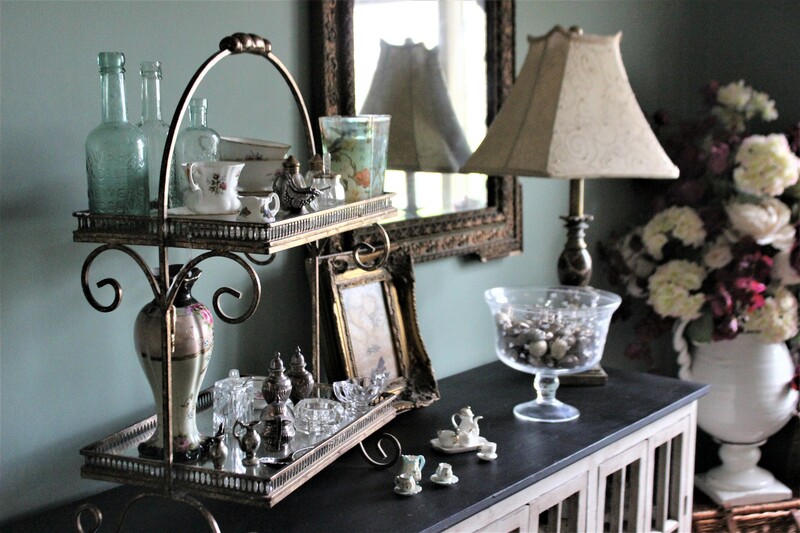 Themes are great for this sort of arranging, but don’t get carried away, a shelf with 42 teapots, or 64 cat ornaments may seem cute, but also might may make you look a bit crazy! so don’t go all one thing in one space (animal clutter is great btw, big fan, just remember to break it up around the house!) So for instance at the moment Ive got a thing for ornamental rocking and wooden horses, yes I have 3 mixed in with this arrangement, but the other 5 I own are scattered on other surfaces . Now , what to pick? Don’t be frightened to break ‘rules’ Pictures and mirrors aren’t just for walls, they look great lent up at the back of an arrangement. 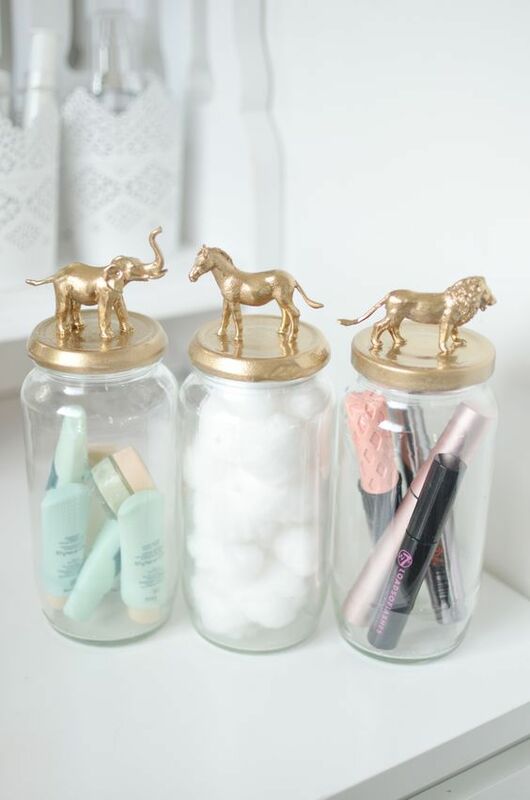 And vases aren’t just for flowers, fill them with feathers, or fairy lights or smaller collectables if its see-through. Yes throw away that rule book! Finally, tip 7 is the maximalist big one – Invest in an ostrich feather duster! Sadly (i think tragically) the reason most people are averse to ‘ornamenting’ is the dust. I get it, it drives you crazy, but not only are ostrich feathers super delicate and light, so you can swish and poke them everywhere without risking breaking everything, they are also statically charged, so they will take the dust away with them , not just move it around. Learn about the best place for interiors shopping on Planet Earth! Truth be told, it is actually my second favourite place on earth, but my favourite place is my bed, and that wouldn’t make an interesting article at all – Stories of falling asleep aren’t what top selling novels are made of after all! So my favourite place (when I’m awake) is, not surprisingly for a female who happens to be an interiors buyer, a Furniture and interiors shopping destination – Hemswell Antiques Centres in Lincolnshire , which is apparently the largest antiques centre in Europe, yet just 45 minutes from my home. I can easily spend a full week there, after all it is vintage heaven, but I try and limit it to a few hours to show I do have willpower! 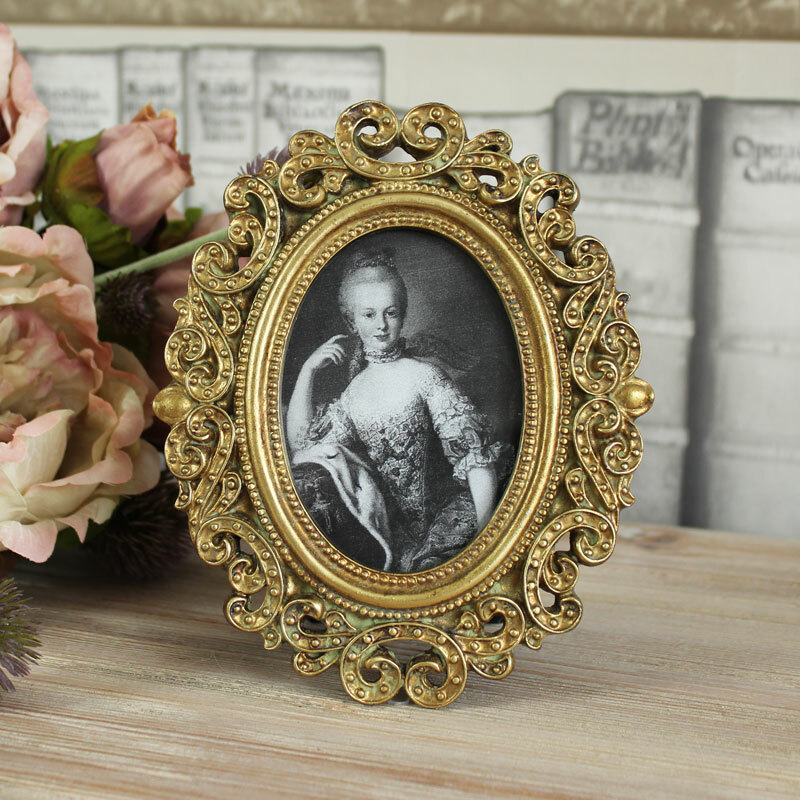 My Home is Edwardian, so antique and vintage items are perfect for it. Don’t get me wrong, I love repro vintage just as much. I couldn’t do what I do for a living if I didn’t, and some things just need to be clean and new don’t they, but my true passion is real vintage. Never expensive though, as I tire of things sometimes a little too easily to be handing over hundreds of pounds, so you are more likely to see me buying mid-century kitsch, and quirky industrial style stuff or inexpensive pretty mirrors and accessories than a mega bucks work of art, albeit I have to stop and ogle those too. The amazing wildlife I saw on a recent visit! – I bought 2 of them! My favourite recent vintage purchase though, and one I think you could easily put in a London boutique for 4 times the price is this gorgeous Pineapple, whose leaves are actual olive forks, This was £9! I do eat olives, but this one just took up residency in my dining room, looking pretty here with other items of loveliness I own. And in my downstairs loo, an ornate mid century gold wall mirror, as you can see from the wallpaper, the theme in here is ostentatious , so a very showy mirror is what was required here. these stunning hand embroidered exotic Birds, probably from the 60s/70s , are so on trend at the moment, sadly wall space dictated another walk away, although as I type this, Im planning a re-visit, they may still be there………. Author Melody MaisonPosted on June 6, 2017 January 25, 2018 Categories Antiques, gorgeous home, interiors, Places that inspire, pottery, shopping, vintage accessories, vintage shopping, Women in businessTags buying antiques, decorating with antiques, inspirational homes, interiors buyer, shopping for homes, vintage buying, vintage home decor, vintage home shopping, vintiquingLeave a comment on Learn about the best place for interiors shopping on Planet Earth! The daring will go for a dark grey, such as the farrow and ball colour Downpipe. With its blue-black undertones, it risks being hard looking, and yet is bold and enchanting and is a fabulous choice for walls and cabinetry. And what about dark grey for walls….and the ceiling. 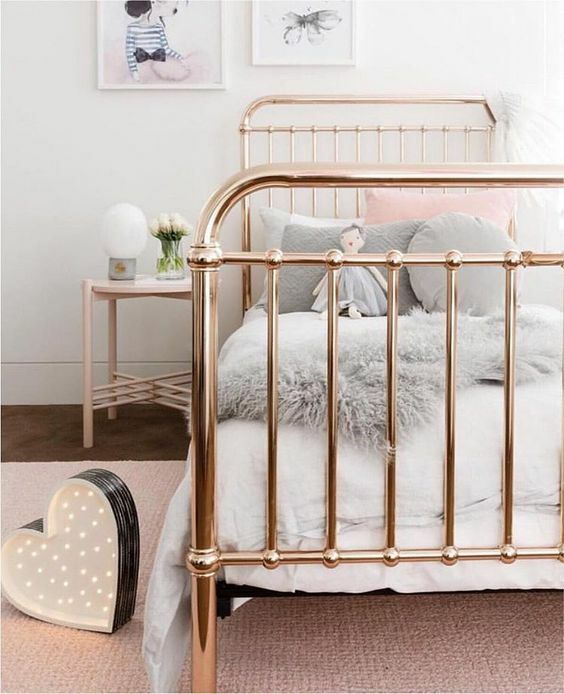 In a bedroom it creates a dark and sinister look to some extent, but before you think this ones for just the vampires, imagine how it wraps you up in a womb-like warmth after dark. I love it. This wow hallway is stunning in mid grey. And with some funky and quirky bohemian accessories (I love the gold cranes and the gold mirror, but I’m not sure where I stand on bug art though!) I think as long as you have a plentiful light source in your hallway, why not be a bit bold with colour. But if these dark grey’s scare you , or you want more warmth to your grey, worry not, slightly warmer shades of grey are popular too. This is a shot from the recent furniture photo shoot we did at Melody Maison, where we used 2 shades, with brown undertones, to create warmth. Both would look good alone too. How great do they look with the French grey collection from Melody Maison? 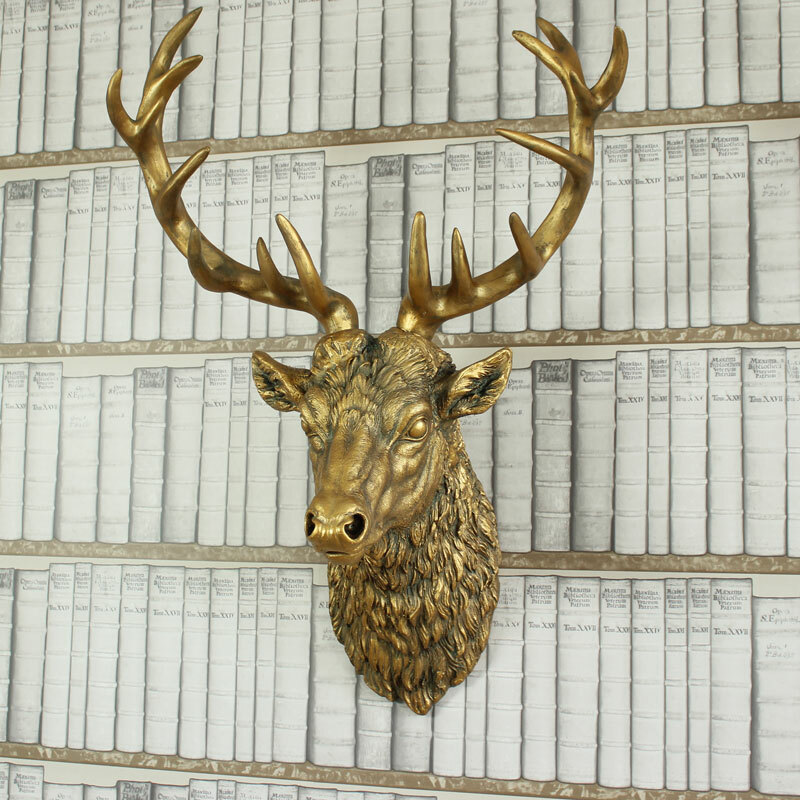 Stags make great drinking buddies! So, if you are thinking of decorating, I hope I’ve inspired you to try a bit of grey in your life, as grey doesn’t have to mean dull! One thing that really makes me gush at the moment is gold. 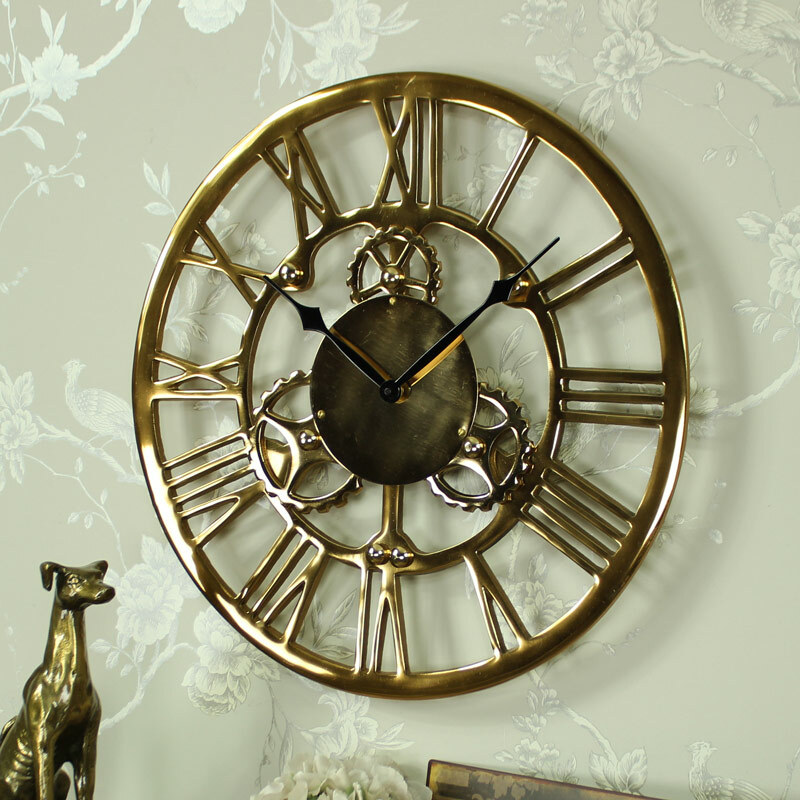 Gold in interiors is back! There’s new gold’s: Rose gold, copper gold yellow gold, white gold… but mainly gold! Against a dark or light background it really does make a statement. 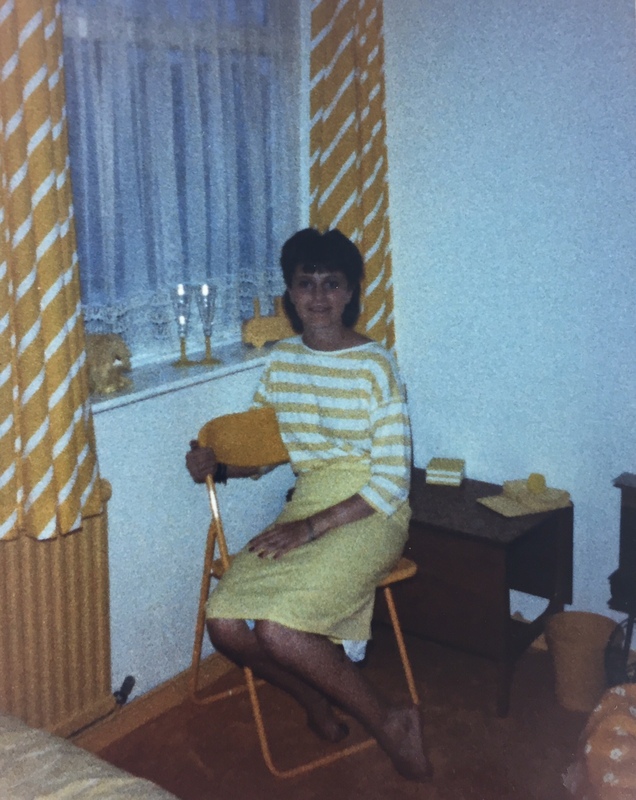 Up until a year or so ago, we were only allowed to admire gold interiors on the quiet, as it was seen as a bit OTT, then one day without warning we were allowed gold again!!.. . I was so excited, because I never really stopped loving it. 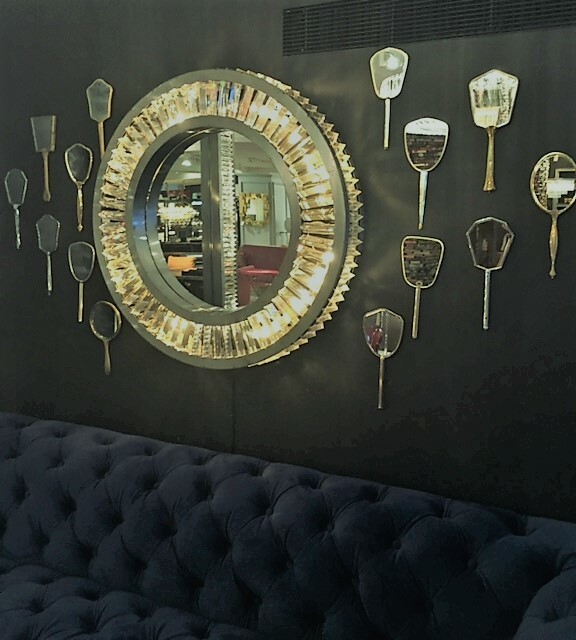 And what about this for a novel idea for a dark wall, I saw this on a fact finding mooch round Harrods interiors department, and if it’s good enough for Harrods, it’s good enough for me! These small vintage vanity mirrors can be easily sourced from eBay, either already gold, or any colour and just do a quick spray job (sadly the light up mirror was one of Harrods, and I dare not say how much that was! 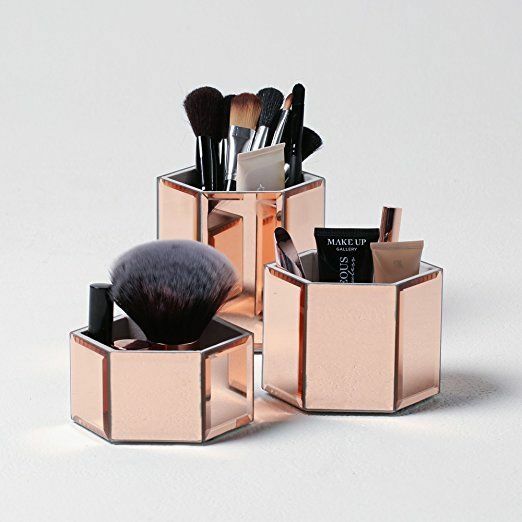 suffice to say Ill be sticking with the vanity mirrors collection! On this visit to London, I also visited some of the shops at the high end of Interiors to get dreamy ideas for my own home. Whilst these shops are pricey, it’s great to see what upcoming trends are around, and also try and replicate them more affordably. One of my Favourite designers is Kate Spade, for home wares and fashion. 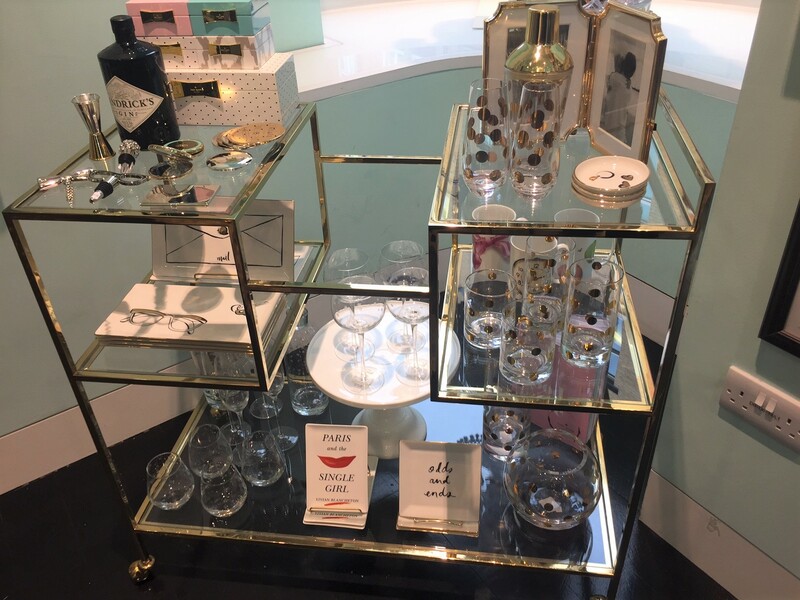 In their Chelsea store, they had my Number 1 gold want, a gold and glass cocktail bar trolley. 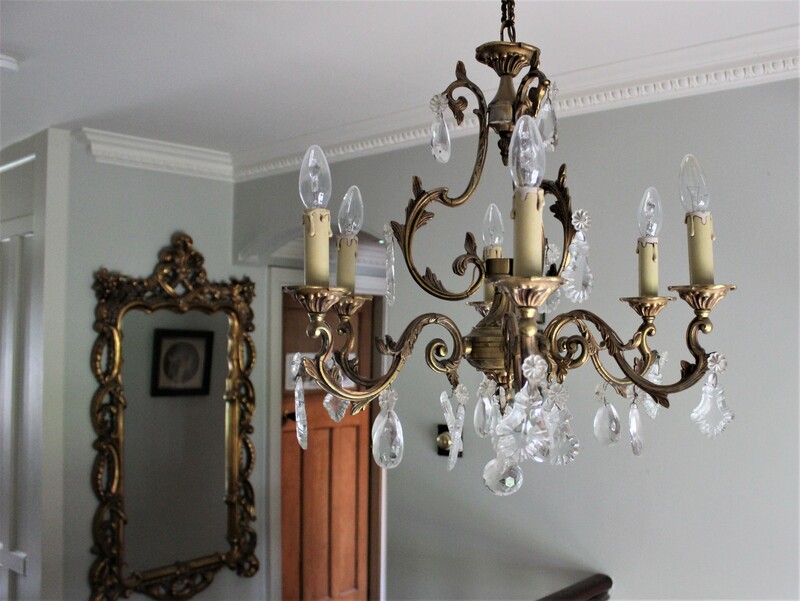 This one is vintage I believe, and unfortunately, one as stunning as this is very hard to come by at a reasonable price, but I will keep my eye out as eventually one of my bargain hunting trips will prove fruitful – Ill keep you posted on that search! 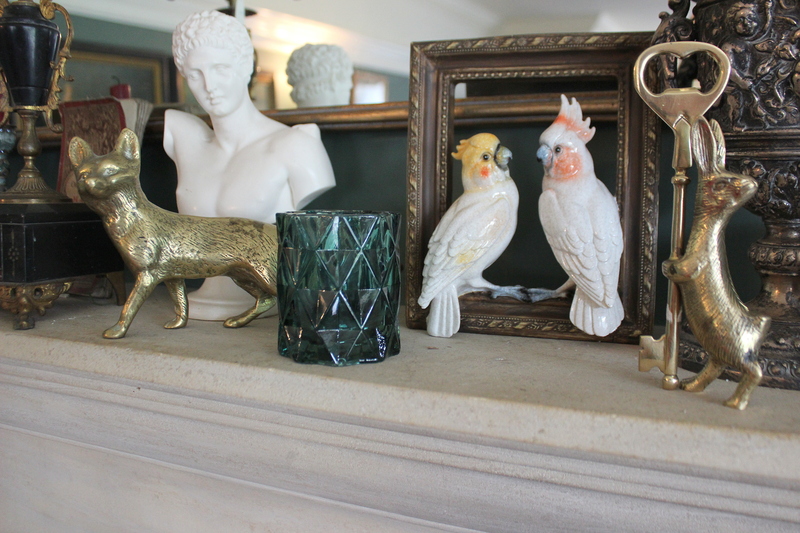 Back in the real world, here are some of my own gold possessions in my home, new and old that I love! 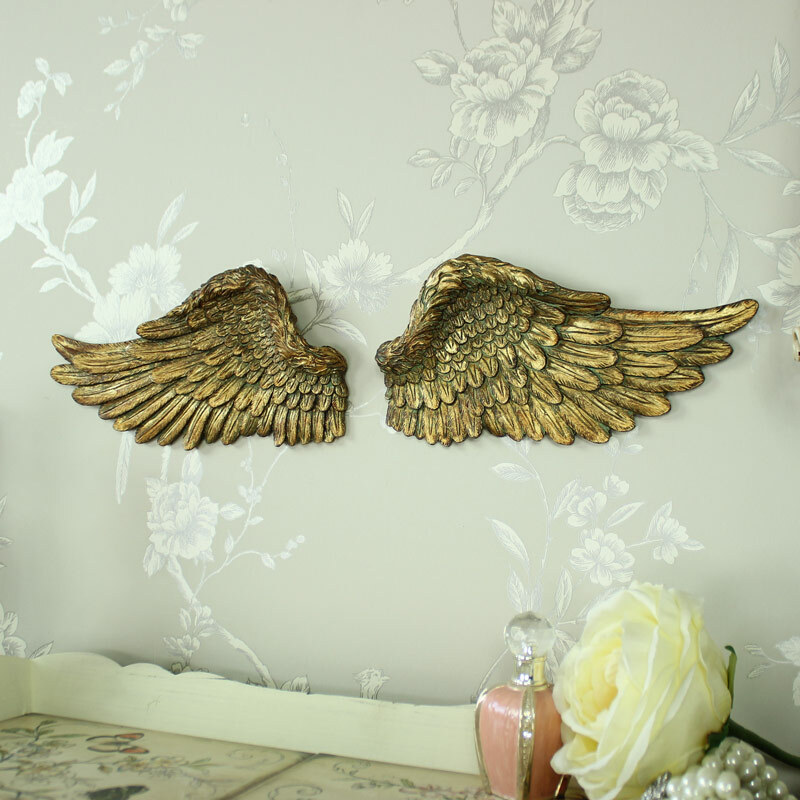 And here is some of Melody Maison’s lovely gold collection, there’s lots more, but these are my own personal favourite’s, and one or two of these, from our 2017 collection, will be finding there way to my house I’m sure! 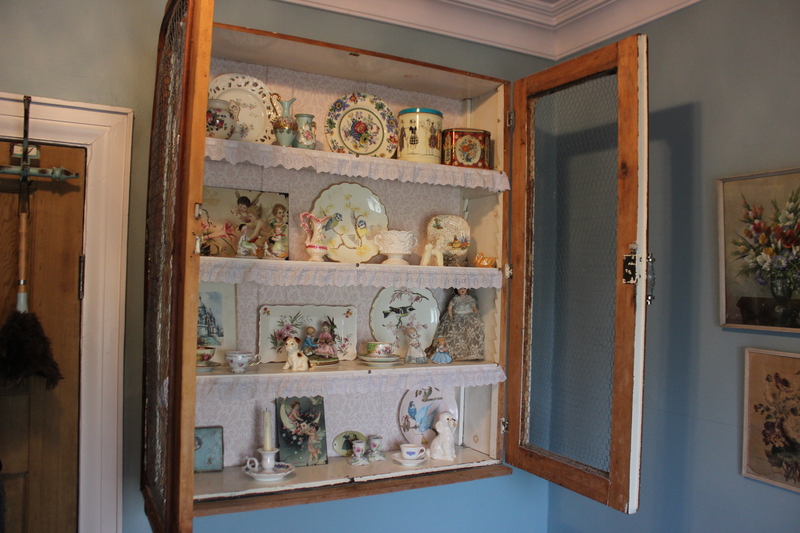 Hi, I am Anna , the founder of Melody Maison , a leading UK based Shabby chic & French style interiors company. When I am not running the business, (and our sister companies Flora Furniture And Windsor Browne) I am usually found either with my family, or pursuing my interiors passion in one way or another. 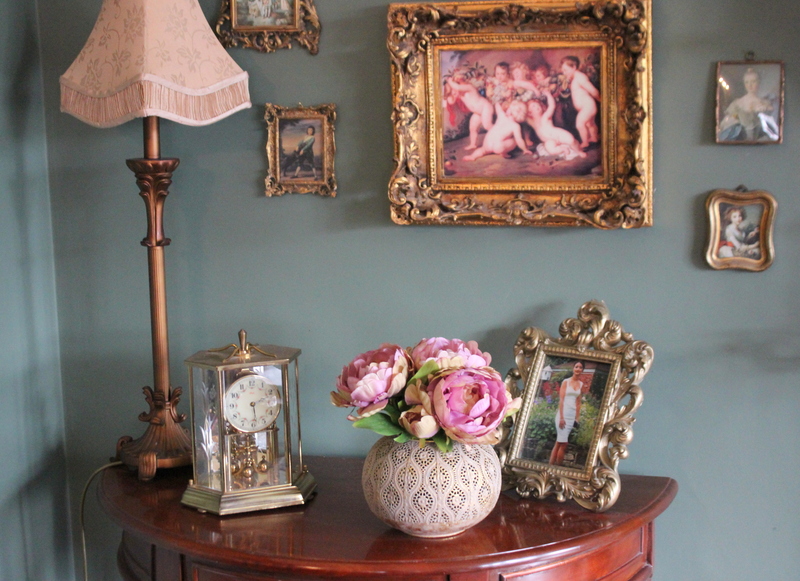 I can often be found searching for vintage finds, or re-decorating a room (i do this a lot, I must be infuriating to live with!!) One thing I am passionate about is creating not only unique, but also affordable interiors. 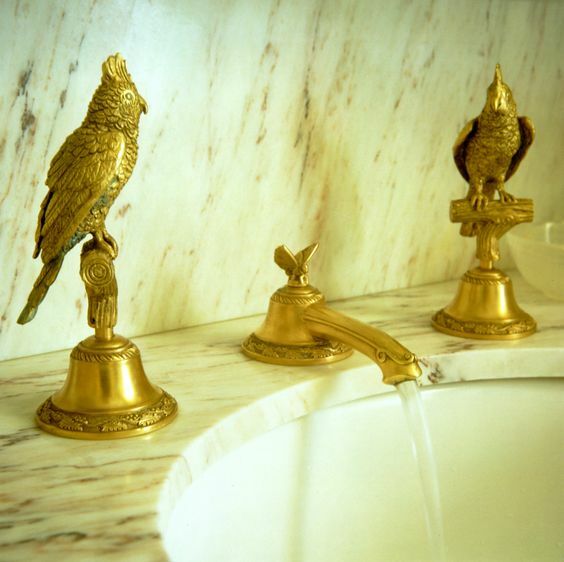 Oh, and in case you’re wondering, the name ‘parrots in the parlour’ relates to my current decorating fetish for ornamental critters,at the moment I have several ornamental parrots adorning my sitting room! Hello, My name is Anna Elkington and I’m a Addict! As people who know me well will testify, I am a grade A ‘housey stuff’ person! 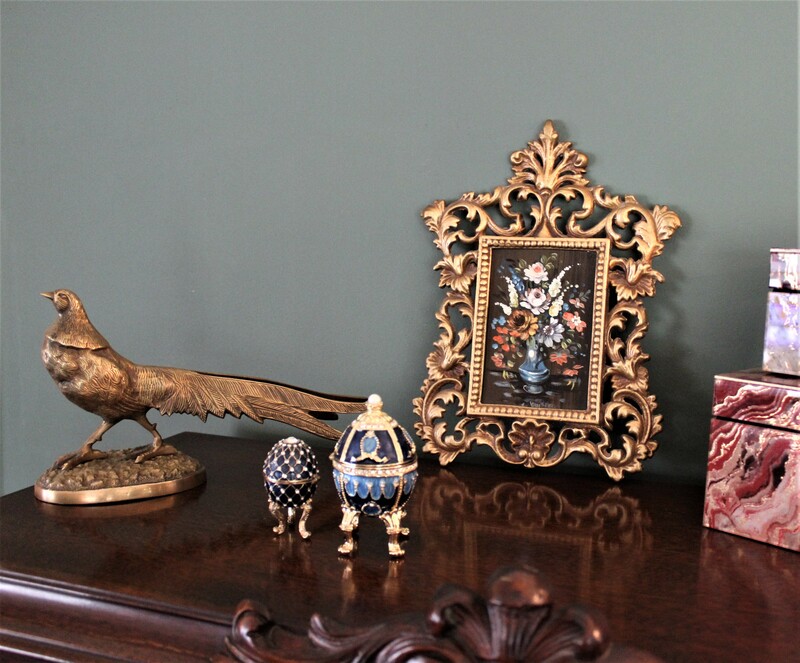 My home is very busy with trinkets, ornamentation and colour, vintage and new. I’m afraid my need to fill surfaces is an addiction, which means I do spend a lot of time re-arranging, and adding more to collections. 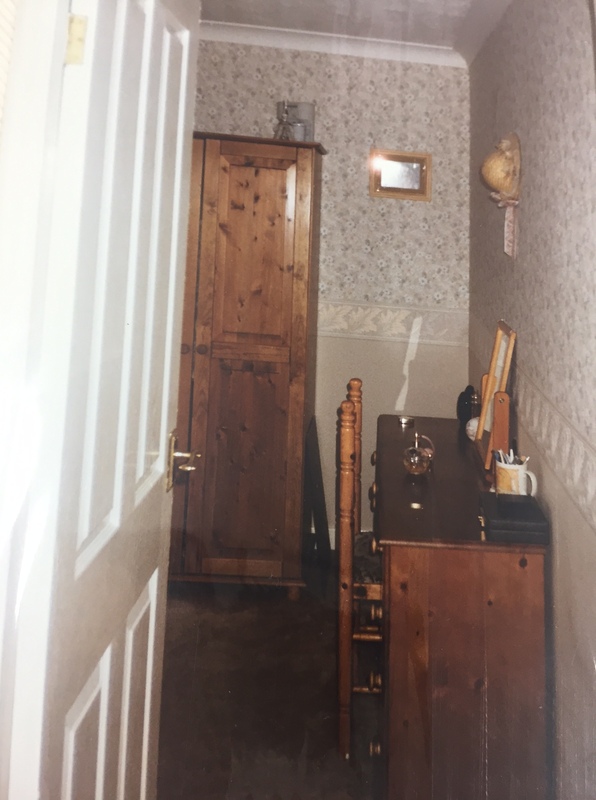 And just for a laugh…..here’s where it all started, this is 14 year old me, in my bedroom at home that I decorated from scratch , by myself, paid for it, made it, all me! (who else goes out and buys there own bedroom carpet with there own money at 14? I clearly got way too much pocket money!) This was the 80’s when a primary colour coupled with white was the only way to go…. What hasn’t changed since the 80’s or 90’s though is my need to shop the way I do, I would spend a small fortune on one roll of stunning wallpaper back when I didn’t really have the money to do so, but equally, I would make stuff, forage in charity shops and jumbles sales and up-cycle. In this respect , nothing has changed, this is who I am today, and whilst I might not have to forego a night out for a new wall like I did back then, I still get a massive thrill from finding a bargain, or making something myself. Skip forward a few years, and here’s just a small sample of what me tick, from the quirky to the pretty. Let me know what you think, and what you love to group together, I would love to know, and read on for regular posts of my home, my interior finds, and of course as an owner of a 3 on-line interiors brands, the stuff I get to see and learn on my buying expeditions for Melody Maison, Windsor Browne, and Flora Furniture.